A picture taken on April 27, 2018 shows men and children walking in floodwaters after the Tana River overflowed at Onkolde Village, in coastal Tana Delta region of Kenya. 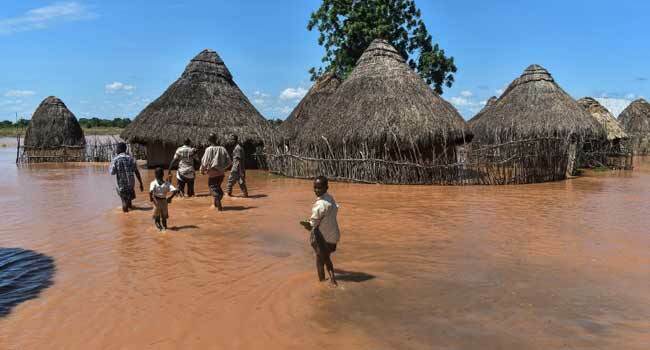 About 64 000 people have displaced from the flooded area, according to Kenya Red Cross. Weeks of torrential rain after a long drought have turned from blessing to curse in East Africa, killing hundreds of people and displacing hundreds of thousands of others. In Kenya, which had suffered from three failed rainy seasons, 120 people have died in two months, including eight who were swept off a bridge in a flash flood Thursday night outside the capital, witnesses said. The Red Cross appealed for $5 million (four million euros) to help those affected. Since early March, “112 people have lost their lives countrywide,” Red Cross Secretary General Abbas Gullet told a press conference Friday, not including Thursday night’s incident. Flooding has washed away bridges and homes, with the military airlifting residents from submerged houses in some parts of the country. “About 48,177 households have been displaced so far and this translates to 260,200 people,” Gullet said. He said over 21,000 acres (8,500 hectares) of crops had been destroyed and some 20,000 animals washed away. On Monday the government announced that up to 100 schools would not open for the second term due to flooding. Somalia, also struck by a severe drought, has received heavy rains and the south-central town of Beledweyne was engulfed by flood waters after the Shabelle river burst its banks. The peacekeeping force AMISOM stepped in to evacuate some 10,000 residents, according to its Twitter account. President Mohamed Abdullahi Mohamed visited the district on Tuesday. “I came here to Beledweyne to share with you the pain and hardships caused by the devastating floods, I know that there are more than 100,000 people displaced from their homes because of the floods and many others still stranded inside town,” he said. Several other major towns along the river have also been affected and local NGO worker Abdulahi Liban told AFP there were concerns of water-borne diseases breaking out. Rwanda has also been seriously affected by the deluge. Its ministry of disaster management said 116 people had died and 207 had been injured in flooding and landslides since January. The ministry said floods had destroyed 120 houses, 23 roads, seven churches, and killed 705 livestock while also destroying 11,300 acres of crops. Torrential rains have also hit Tanzania, where 14 people died in April, as well as Uganda where flash floods have destroyed homes and left at least three dead, according to police in both countries. Authorities have warned that the deluge will continue. “The heavy rains are still on and we advise people to take precaution. Farms have been destroyed and roads made impassable. This will cause food prices to go up as we have already experienced in some parts of the country,” said Uganda’s minister for disaster preparedness, Musa Ecweru. A severe drought across East Africa last year left Somalia on the brink of famine, while more than three million required food aid in Kenya and almost eight million needed aid in Ethiopia. Food prices and inflation soared in the region as a result.